Burn your files to DVD & CD quicker with CD/DVD burner program. 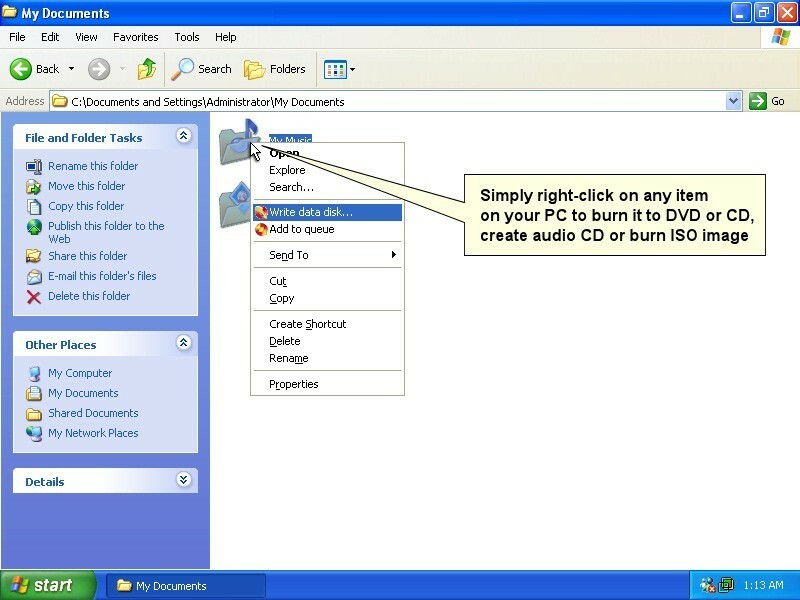 With context menu-driven interface One-click CD/DVD Burner offers incredibly easy way to burn anything to discs. You can right-click any files or folders, such as your favorite MP3 music, movies, documents and pictures to burn them directly from Windows Explorer. One-click CD-DVD Burner can also convert audio files of different formats to audio CD. All you have to do is right-click MP3, WMA or FLAC music files and pick "Burn audio CD" option. In addition CD-DVD Burner can burn ISO files to CD and DVD and erase any rewritable DVD and CD discs. Its handy interface and easy options will help you create your own CDs and DVDs quickly and easily.